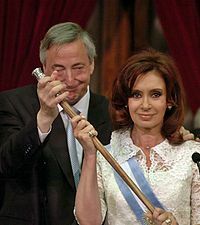 The center right government of Argentine President Mauricio Macri, in power since December 2015, has been struggling to reverse 12 years of financial and economic mismanagement, under the former left-wing populists President Cristina Fernandez de Kirchner and her husband Nestor Kirchner. 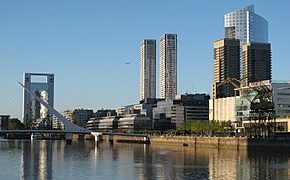 Argentina, once the wealthiest country in the region,remains the third largest economy in Latin America, after Brazil and Mexico. However, it is quite evident that Colombia will slowly close the gap, unless Argentina adopts a more long term pro-growth model. Although Venezuela remains the worst managed economy in Latin America, Argentina under the former president comes in second, along with massive corruption. The full extent of the damage to the economy of Argentina, was somewhat obscured under the previous administration. This was due to the fact, that once the government had taken over the Statistics Institute (INDEC) in 2007, the political manipulation of the data, soon undermined its reliability. By 2013, a number of foreign agencies, banks and investors, no longer had any confidence in the INDEC. When Macri first took office, real inflation was running at an annual rate of at least 26%. Yet, the government was reporting a level, near half of that. During the first year of his presidency, Macri ordered a statistics emergency, allowing INDEC a year, to begin calculating more accurate figures. In the meantime, private firms estimated that inflation throughout Argentina for the year 2016, likely exceeded 40%. This was to be even higher, than the presumed rate of 38% from 2014. That inflation was going to be higher, during the beginning of the Macri Presidency, is coming at a high political cost. Even in 2017, the rise in prices was still near 28% and is expected to be about 23% for the entire year of 2018. As to be expected, the electorate is starting to lose patience, with the reformist fiscal and economic agenda. Macri also made the difficult decision, concerning the Argentine currency. Once he allowed the peso to float, by removing capital controls, it devalued by 29% in short order. This dramatically increased the price of all imports, coming into the country, further fueling inflation. Buenos Aires the capital of Argentina,is the 2nd largest city in South America. It is 1 of the only three “Alpha -” cities in South America & it’s the most visited city on the continent. This comes on the heels of growth, that has been slow for an emerging market. Although the economy did grow 2.8% in 2017, it followed a recession from the previous year, where the economy contracted -1.8%. There was 2.7% growth in 2015, but once again that followed a recession in 2014, where there was a -2.5% shrinkage of the economy. As one can clearly see, overall economic growth for Argentina, over the last few years, has been negligible. Unemployment has fluctuated between 7% and near 9% since 2013. The present rate will not be reduced by much, until the economy is allowed to grow faster, creating more jobs. As the financial crisis deepens with Argentina,real GDP (Gross Domestic Product) growth which was expected to be near 3.5%, has been reduced to just 1.4% this year and 1.5% to 2.5% in 2019. The World Bank in particular, has reduced a 3% forecast of growth in 2019, to just 1.8%. Some emerging markets have been crushed, in 2018,mostly caused by a stronger USD (United States Dollar). Brazil‘s stock market lost -16% this year,Argentina’s is down -22%, and Turkey‘s is lower by over -25%. Argentina is a commodity dependent emerging market. Previous governments have almost consistently made the mistake, in attempting to artificially create a middle class, without modernizing the economy. Despite previous governmental efforts, 25.7% of the total population is still considered poor. They are living on the equivalent of $130 USD or lower monthly. A full 35% of households, earn an income that falls below the poverty line. Middle class people are getting by at $341 USD and the wealthy between $910 & $13,681 USD. This means wealthiest 10%, earn 120 times the income of the poorest 10%. 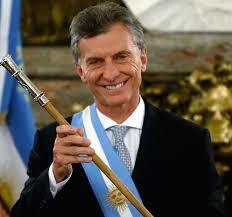 The economy of Argentina is now in a trap, with all options likely to inflict pain on the electorate . In addition, time for Macri may well be running out, as frustrated voters lose patience. Outside observers have identified two critical mistakes, the new government likely made. The first was the premature lifting of all exchange controls. This was done before the reduction of inflation and a stabilization of the economy. It left the economy extremely vulnerable, to any reversal in international capital flows. 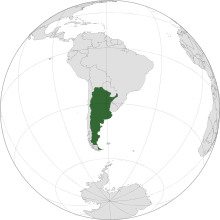 Argentina on a global map of South America. The second was the policy of gradualism to the major economic in-balance inherited from 12 years of gross mismanagement, under the far more leftist and populist Kirchners. The two most important issues now are the huge budget deficit and the external current account deficit. If United States (U.S.) interest rates had remained exceptionally low, foreign investors may have continued to buy Argentine debt. However, with the U.S. Federal Reserve (central bank) tightening the money supply, and U.S. 10 year Treasury yields moving to 3%, investors are finding Argentina too risky. Tightening monetary conditions elsewhere, have reduced global liquidity, putting the Argentine stabilization effort in jeopardy. The peso is now down by a third for 2018. This was despite the central bank selling USD in the foreign exchange market on a massive scale, in an attempt to support the peso. The Argentine peso is now the worst performing major currency worldwide. To help stabilize the peso in early May of this year, Argentina hiked the benchmark interest rate to 40%. In was a dramatic bid,to shore up the currency with 3 rate hikes in 8 days. No modern economy can sustain interest rates at these levels for long, without a resulting recession. Chances of an economic recession have risen from 24.4% in April to 68.1% in May, according to one university study inside the country. If a recession arrives, it will be the fifth one in the past decade. Inflation is currently running at about 28%. Argentine consumers are already losing confidence in their own currency, once again. There is a heavy rush of citizens already hoarding dollars, as the expectation is that the current financial and economic situation, will only worsen. Historical economic growth of Argentina from 1961 to 2016. Government inflation targets are 17% for 2019, 13% for 2020 and 9% for 2021. This means that consumer prices will continue to rise at a rapid rate, and interest rates will need to stay elevated in response. At the same time, public debt continues to rise,both internally and externally. It increased from 43.5% in 2013 to 52.6%, at the end of 2015. Despite the change in government, debt continued to rise from 53.3% in 2016 to 57.1% in 2017. Although the total percentage is still relatively low, the rapid rate of increase, remains troubling to many investors. The Argentine economy is already being battered by rising international oil prices and a prolonged drought, the worst in 50 years. Part of the decline this year, can be attributed to the severe drought in the Pampas grain belt. It will drastically reduce, the size of the corn and soybean harvest. 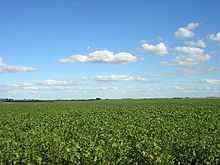 Soy field in Argentina’s fertile Pampas. The versatile legume makes up about half the nation’s crop production. Given the importance of agriculture to both the domestic and international market, the effect will be felt throughout the economy. 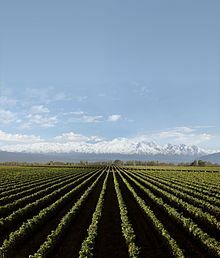 Argentina witnessed a 30.8% drop in the agricultural sector in April alone, due to poor weather conditions. By the middle of May, Argentina’s peso had fallen to a record low. It had tumbled almost 7%, to 25 per USD. The currency has already fallen by 26% in 2018, the worst in emerging markets,as the IMF (International Monetary Fund) said it would not set any exchange-rate targets for a stand-by arrangement. By June, the country was moving towards a crisis. Argentina was on the brink of a financial collapse, when the IMF had begun bailout negotiations,with the peso falling even further against the American Dollar. The Argentine peso can hardly recover, with the nation dogged by persistent budget deficits,high inflation & trade imbalances. Foreign borrowing to finance the deficit, was causing the current account deficit to explode. Later in June, the IMF agreed to give Argentina a $50 billion line of credit, to help the country out of a deep financial crisis, since the peso had dipped 20% versus the dollar, since late April alone. The reliance on the IMF for a bailout remains controversial, since many politicians on the Argentine left, still blamed the 2001 economic crisis, on this international monetary agency. The month of June also saw the government of Argentina, moving to replace both its energy and production ministers, in addition to replacing the former Central Bank President Federico Sturzenegger, who had resigned. In spite of the infusion of the IMF money in the form of SDR, the Argentine peso plunged another 7% in the first week of July. The depreciating currency, along with the rapidly rising inflation, despite sky high interest rates, make a recession now far more likely. If the government budget deficit continues to widen, it will subsequently threaten the deal with the IMF. The government will need to find another $8.9 billion USD in further cuts in 2018, to meet the revised fiscal deficit target of 2.7% of GDP. This is down from an earlier rate of 3.2%. The deficit was 3.9% in 2017. As part of the agreement with the IMF, it will need to drop to a shortfall to 1.3% of GDP next year and to zero by 2020. To meet this fiscal goal, the federal payroll will need to be substantially reduced. Consumer subsidies will have to be drastically cut and fiscal transfers to the provinces, significantly pared. Major infrastructure projected will either have to be postponed or possibly canceled. Argentine stocks did reverse somewhat at the end of the second business quarter, after index provider MSCI, upgraded the country to its emerging markets index, a respite from months of dismal economic news. But this development will only provide temporary relief. 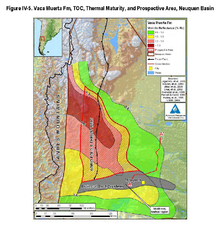 The Vaca Muerta shale oil field holds 16.2B barrels of oil & 308 cubic feet of natural gas. It is estimated to be the 3rd largest in the world. If a recession occurs, the budget deficit will automatically widen, as tax collections decline. This will force even more stringent, spending reductions. These of course, will be politically unpopular. This will be the second recession, since Macri has taken office. Presidential elections are now drawing near, the next one is in 2019. Although Macri’s party did well in the October 2017 elections, nerves and patience are beginning to fray. His popularity is still at 40%, but is under increasing pressure. It is also important to note, that President Macri lacks control, in either house of the Congress. As usual, Argentine voters have the expectation that a new president and government, can simply erase decades of politically expedient, but economically ruinous policies. The opposition left leaning Peronist party, continues to agitate for higher wages and is organizing strikes, to force the government to meet ongoing labor demands. The General Confederation of Labor, the largest trade union in Argentina, called for a general strike on June 25th. It was in the protest of present government economic policies. The work stoppage brought the country, to a near standstill. 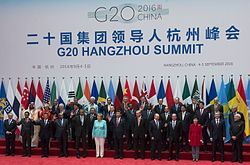 Argentina is one of global G-20 major economies. Further labor disruptions can only be expected. 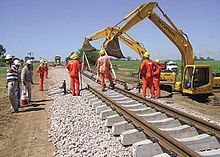 If President Macri is forced to give into concessions, to partially satisfy worker demands, it will retard further progress with budget deficits and the rate of inflation. Macri despite his pro-business pragmatism, may well be forced to reinstate capital controls. He has pledged to gradually unwind the numerous government subsidies, that have distorted the market over the years. His goal was to attract a new wave of foreign investment to Argentina, which is now under threat, given the lack of financial stability. The question now remains, can President Macri turn the economy around, before facing the voters again in 15 months? Or failing that, will the Argentine electorate give him more time, to reform the daunting financial and economic difficulties, still facing the country?